Verdict: 4 / 5A fun read with continuously high stakes and a frenetic pace leaves me wanting more of No Justice! Following on from the events in the previous issue of Justice League: No Justice, the teams of assembled heroes from across the DC Universe are met with a whole host of surprises and challenges that seek to test their strengths working together as one when they arrive on Colu, the homeworld of Brainiac and his species. 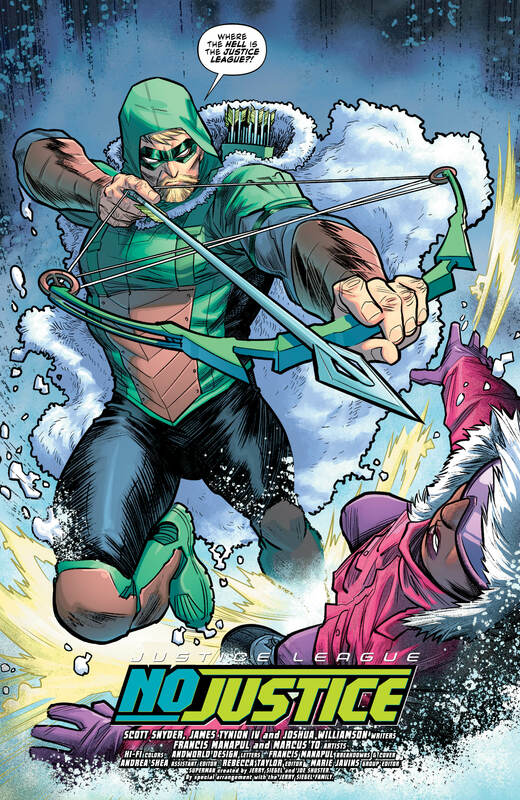 Meanwhile, back on Earth, Green Arrow has tracked down Amanda Waller, revealing that he is the last hero left on the planet and it is up to them to hold the fort and sort out whatever mess Waller has gotten them into. No Justice continues to be entertaining, focusing more upon the action this time round, although shining most during its character interactions. A concept that is continuing to impress, No Justice’s new set of teams is perhaps the highlight of the title so far. Splitting them up into factions that have a theme and giving them tough decisions on how to work together and move forward in their quest to save Colu and indeed Earth, the series is at its best when delving into the complex character relationships and differing ideological viewpoints. Batman is surprisingly quiet in Justice League: No Justice #2, with Martian Manhunter being the alien to bind the teams together as a coherent player to unite the Justice League and restore order in the universe. Although it is still unclear how the orbs work, the most interesting aspect of this book is the reaction of Brainiac’s people to the arrival of the heroes, with Brainiac being the worst of their species to come off the planet. The best interactions in the book are Lobo and Beast Boy’s, as well as Starro with literally anyone, by far. An intelligent, witty character, Starro is a weird fit in comparison to the rest of the characters on the page, but a welcome one. The villainous dynamic, especially with Sinestro being the voice of anti-heroes and Luthor the voice of reason, is a nice touch from Snyder and the team. The main villains have still not been fully explained and I’m starting to wonder if they are the main threat at all. Plus, the final reveal leaves many questions as to where the title will go from here. 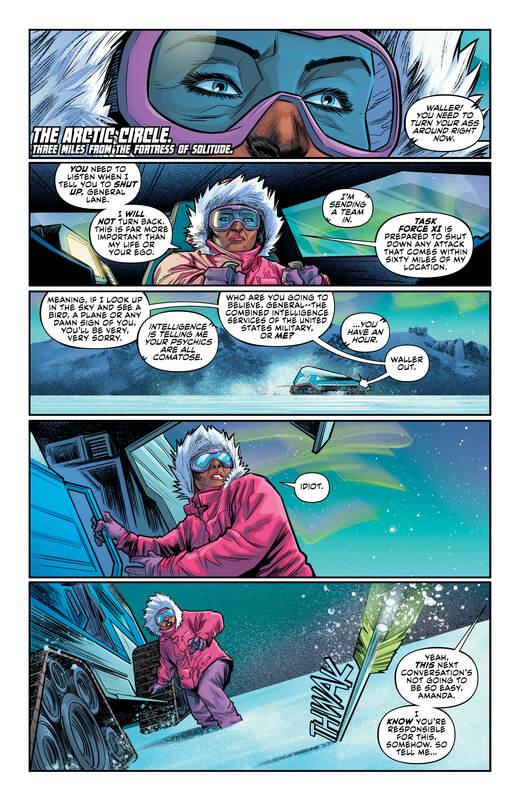 The artwork here was stellar and some witty and fun writing kept this entertaining. Perhaps I would have liked to see a few more pages to not rush through some of the interactions, actions set pieces and especially some of the conflicts, but there were no major pacing issues. Overall, Justice League: No Justice #2 is a good continuation of what we have seen before, although amping up the action slightly. The concept that hundreds of planets may soon be released into the universe leaves a lot of questions to the future of DC and how this event will impact the rest of the issues.